Call for Proposals for a ten year perspective issue on pedagogy and learning in immersive environments led by Dr. Kenneth Y T Lim, Nanyang Uni. 2019 marks the tenth anniversary of a landmark issue of the Journal of Virtual Worlds Research, which was themed on ‘Pedagogy.’ Volume 2 Number 1 of the journal was the fruition of a vision of the late Leslie Jarmon. Dr Jarmon was a pioneer academic in the use of virtual worlds and immersive environments for learning, and the issue at the time (2009) – was the cutting edge of academic thought on what the affordances of virtual worlds are, and how they could be leveraged for learning. Interested authors are requested to submit a 500-word abstract by Aug. 20, 2018 via email to [hidden email] address. After review by the issue editors, authors of the accepted abstracts will be invited to submit original scholarly papers of 3000-5000 words (including footnotes, references, and appendices). The guest editors are happy to discuss proposals for contributions. Please contact Dr. Kenneth Lim at kenneth.lim AT nie DOT edu DOT sg for questions prior to submission. The full submissions should be made directly via the JVWR publishing system by October 20, 2018. For detailed instructions see www.jvwreserach.org > About JVWR > For Authors. All submissions will be peer reviewed using the JVWR double-open policy, which means that authors do not need to anonymize their papers, and reviewers' identity is known to authors. See more details at JVWR site --> About JVWR --> For Authors --> Our double-Open Policy. Potential co-editors for this special issue are invited to approach the journal editorial team ([hidden email]) with CV and a cover letter depicting your interest and background in Virtual Worlds. 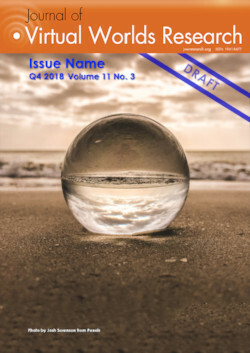 The co-editors assist in managing the review process, supervise the final publications, and distribute the news about the release – all using The JVWR internal state of the art publishing process. The Journal of Virtual Worlds Research (http://www.jvwresearch.org/) is an online, open access academic journal that engages a wide spectrum of scholarship and welcomes contributions from the various disciplines and approaches that intersect with virtual worlds research. Virtual worlds ignite a continuously evolving area of study that spans multiple disciplines and the JVWR editorial team looks forward to engaging a wide range of creative and scholarly research. Copyright © 2018 Journal of Virtual Worlds Research, All rights reserved.